In the Eastern Orthodox Church, Lent (a 40 day fast) is practiced before Christmas as well as before Passover. Fasting Lent is not an option, but rather an expectation of every Christian. While on certain days fasting means eating only one meal of bread and water per day, most of Lent entails fasting from any foods that come from animals (e.g. meat and dairy) or made with oil. One may be skeptical of the Orthodox fast, as luxuries like dark chocolate and coffee are allowed – an aspect that may irritate certain ascetic sensibilities. But I still think the fast is valuable and particularly important in our day and culture. 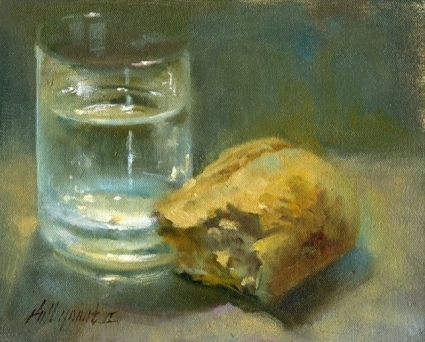 The Orthodox Lent also develops a consciousness for eating. Every time you sit down to prepare your meal, you have to consider what is in it. In a culture of fast-eating and in a food market where meals are prepared and packaged for consumption, we are largely out of touch with what we are ingesting. We eat unconsciously. Lent gives us space and distance from our aggressive culture. The fast helps us to think about the fruits of the earth, about the miracle of life and the growth of delicious and nutritious foods that come into being from a seed and dirt and water. When we stop to thank God for His goodness in providing our daily bread, we gratefully recognize where the food came from, who labored for its cultivation and preparation, and how it arrived on our table. The Orthodox Lent also impedes our drive for immediate gratification. We live in societies that measure their collective health by how much their citizens consume. Therefore, consumption is made to be fast and easy. Fast-food, internet delivery and credit-based spending all enable easy consumption in the now. But fasting cultivates delayed gratification and delayed gratification, like physical exercise, makes us stronger and healthier. By disciplining our intake of certain foods, we enjoy them more when we do eat them. Fasting also develops our power to wait. Here, patience is the ability to endure sacrifice in order to receive something better in the future. By saying “no” to our desires to immediately have and consume, we develop an inner strength that is less motivated and manipulated by desire. Although Lent is demanding and challenging, it is a celebration. It is a celebration of life together, of consciousness, and discipline. Much more than this, the Lenten celebration is anticipatory: looking and longing for the coming of God.